Calling all Skywatching and Space Fans ! 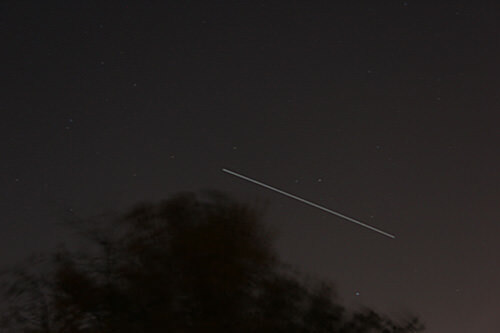 This is a great week for observing the International Space Station (ISS), swiftly crossing the evening nighttime sky. All this week from Monday thru Saturday, folks all across vast portions of the United States and Canada will be treated to fabulous viewings of the International Space Station. And at very convenient viewing times in the early evening, after dinner and in prime time. From Maine to Vancouver, from Ohio to Texas, from Florida to New Mexico – many of you will be in for a rather pleasurable ISS treat. Of course the exact viewing times, days, elevations, durations and directions varies greatly depending on your exact location – and clear skies. And the viewing parameters change daily. Check out this NASA website for Human Spaceflight Sighting Opportunities. It’s simple. Just plug in your country, state and select a local town. Also check out – Heavens Above. This evening, Monday April 9, I shot a few 20 to 30 second exposures as the ISS was speeding past at about a 30 degree elevation. But the best viewings at far higher elevations are yet to come the remainder of this week. The International Space Station is the brightest manmade object in the night sky and even brighter than Venus depending on orbital mechanics. Only our Sun is brighter. Since Venus is an evening observing target this week, maybe you’ll even be lucky to see the ISS seem to pass close by that hellishly hot planet. Have you ever looked at the ISS hurtling overhead ? Take some shots and send them to Ken to post here at Universe Today. And remember, 6 Humans from the US, Russia and the Netherlands are currently residing aboard the ISS, conducting science research and sending back gorgeous shots of all of us back here on Earth. Should be good sightings over the UK on 14th & 15th weather permitting. Thanks for this feature however …. The world does not stop at the US boarder! The ISS will be well seen for at least the next 10 days from the UK. http://www.heavens-above.com gives passes worldwide.